The mythical unicorn is spotted! I've long heard of double rainbows. I believed them to be on the same level as fairies and elves. Things I've read about, perhaps seen a photo of, but never seen in person. This labor day trip would net me two unicorns. The prior day while driving through some light rain, I spotted a double rainbow. The following morning, I made my way to Arches National Park to watch the sunrise over the windows, which is next to turret arch. The sunrise was a little disappointing, but somehow, a rainbow appeared behind me over turret arch. And then, it became a double rainbow!! The luck! Having gone from never seen a double rainbow in my life, to seeing two double rainbows on consecutive days, was amazing! 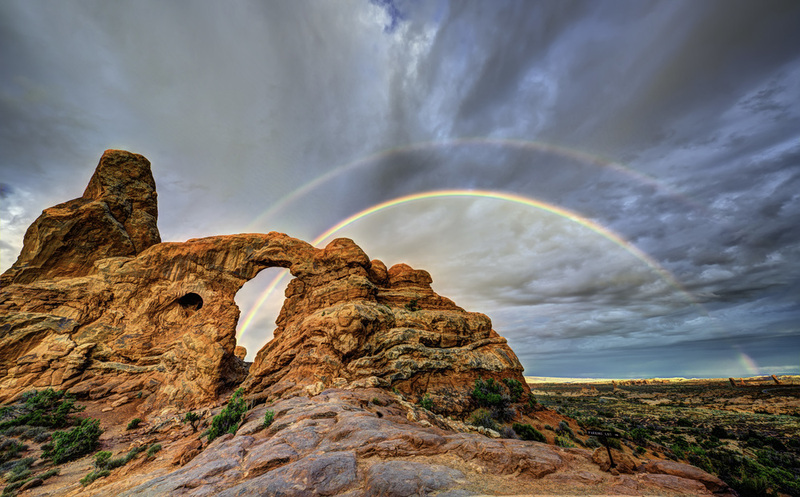 I love to travel, and now I'm wondering if there's something special about Utah that it just throws double rainbows at you left and right.